The newly opened University of Nebraska-Lincoln (UNL) College of Business building quickly is becoming known as the "heart of the UNL campus," thanks to its prominent location and distinctive design featuring curtainwall from Wausau Window and Wall Systems. Demonstrating the importance of this project, alumni and private donations funded the $84 million construction project, the largest of its kind in UNL's recent history. 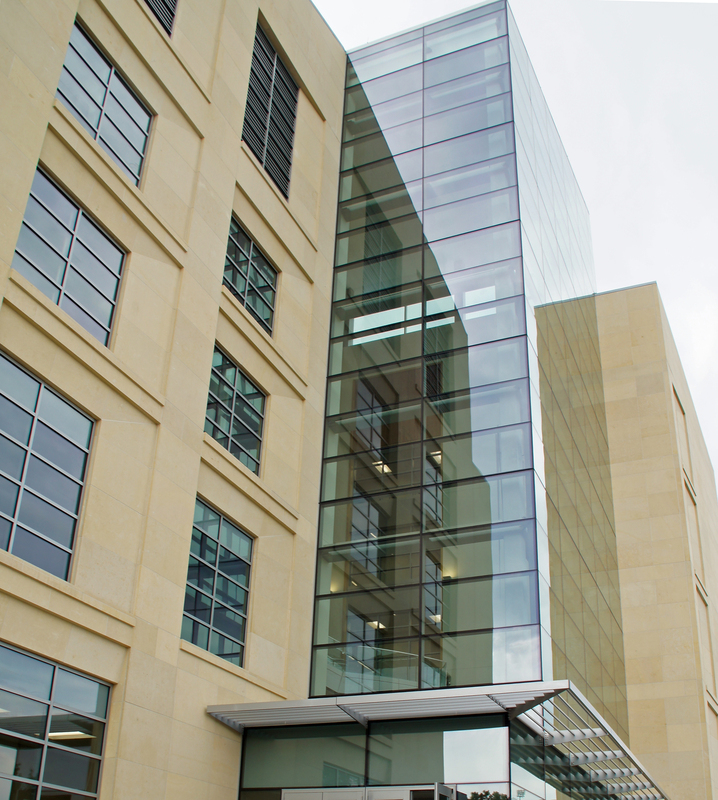 According to the project's lead architect, New York-based Robert A.M. Stern Architects (RAMSA), Wausau's curtainwall was used to "provide a sense of both openness and permanence" for the new College of Business building. Sustainable design and construction to meet LEED® Silver criteria also were top-of-mind for RAMSA and Alley Poyner Macchietto Architecture (APMA) of Nebraska, the project's associate architect. The new five-story, 240,000-square-foot building sits at the east end of the campus's iconic Memorial Mall, bookended on the mall's west end by UNL's beloved Memorial Stadium. 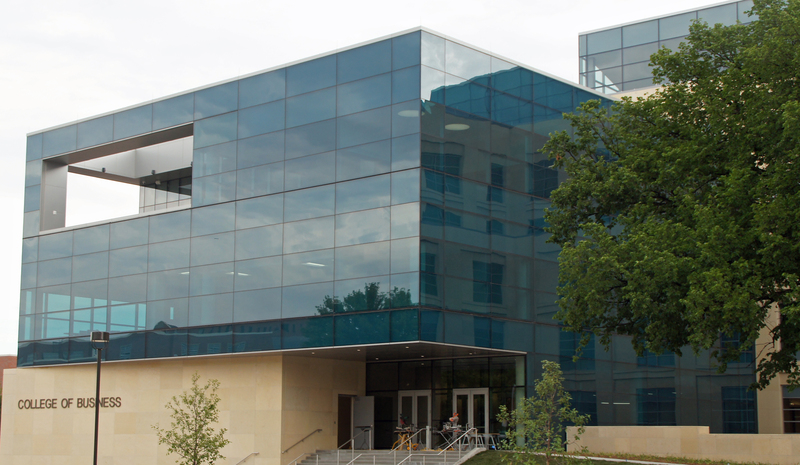 The building's public face features a glass-clad cube that creates an impressive, formal entrance from Memorial Mall for staff, students and visitors. Two stacked masonry-clad wings frame the cube, and the two wings are flanked by the building's focal point: a central, four-story light-filled atrium that runs the full length of the structure. Entrances at both ends of the atrium lead into a large open lobby area featuring a sculptural staircase. The lower level features two auditoriums, a pre-function space and several large classrooms. 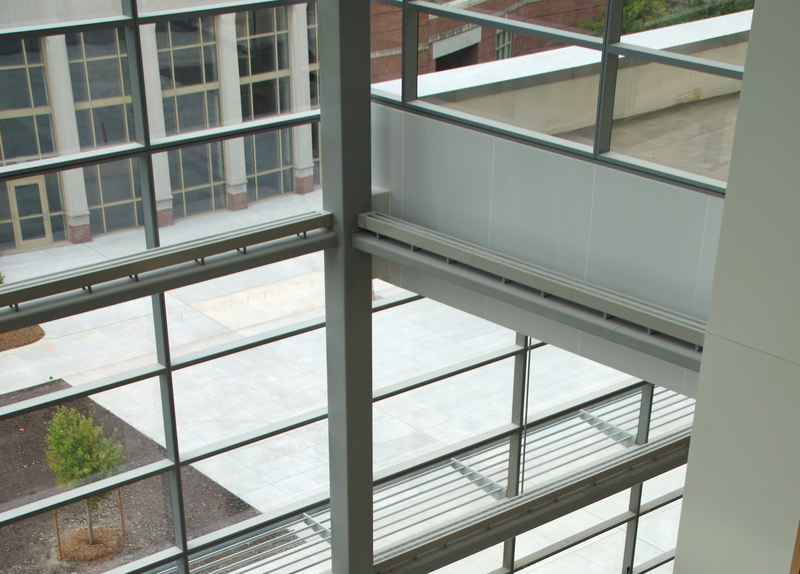 The second floor includes a graduate wing and the remaining undergraduate classrooms, which are arranged around the main floor of the atrium. Wausau's engineering team previously worked with RAMSA on such notable projects as The Clarendon Boston residential tower, Penn State University's Smeal College of Business and Virginia's Richmond Federal Courthouse. "Thanks to a good relationship and solid history of successful projects with RAMSA and APMA, we were involved early in the project," says Doug Laffin, Wausau's architectural sales representative. "We were able to propose an engineered solution to match their design goals, as well as to provide input on realistic budget pricing and meeting the aggressive schedule." Wausau's INvision™ unitized curtainwall systems were established as the basis of design. General contractor Hausmann Construction selected City Glass Co. and Glass Edge as the glazing contractors. Together, they installed more than 60,000-square-feet of Wausau's curtainwall. On the unique "Cube" terrace curtainwall, Wausau made extensive use of 3-D modeling to bring RAMSA's vision of a fully glazed terrace envelope to life. Structural columns, flying beams, parapets, handrails and exterior walls were all clad with factory-glazed, unitized curtainwall panels, integrating with the main façade, intersecting in three orthogonal planes. Shadow box spandrels were employed for visual continuity. The design expression for the "Atrium" curtainwall included aerofoil-louvered sun shades extending outward more than 5 feet from the glazed curtainwall face, near mid-height of a sloped-head span peaking at more than 21 feet. Sun shade assemblies were designed to wrap oblique corners, while withstanding Nebraska snow and ice loads. Using finite element structural analysis and 3-D modeling tools, Wausau was able to create a system without external reinforcing, again, blending seamlessly with adjacent curtainwall. Unitized systems are glazed and sealed in Wausau's factory-controlled conditions to achieve the intended performance required for the project. Typically shipped one lite wide by one floor tall, the interlocking, pre-assembled units make the system easy to install on the job site. This saves labor, time and associated costs. "Using INvision unitized curtainwall, installation time is a fraction of what's necessary for field-glazed systems. Handling for each unit is minimized, which decreases the opportunity for a mishap and saves time overall," explains Laffin. "The curtainwall's interlocking frame design accommodates seismic, live load and thermal building movements. Low U-Factors allow broad expanses of vision glass to meet Model Energy Codes." The majority of the building envelope relies on 8750-UW Series four-sided, structurally glazed, curtainwall. In addition, Wausau's 6250i-HRX Series curtainwall was installed. Integrated with the curtainwall, spandrel shadow boxes and Wausau's ClearStory™ sun shades give the glass façade added depth, aesthetic distinction and functional performance. Exterior sun shades help intercept unwanted solar heat gain before it can impact the building's HVAC system's load and economize natural light by redirecting it inside the building. 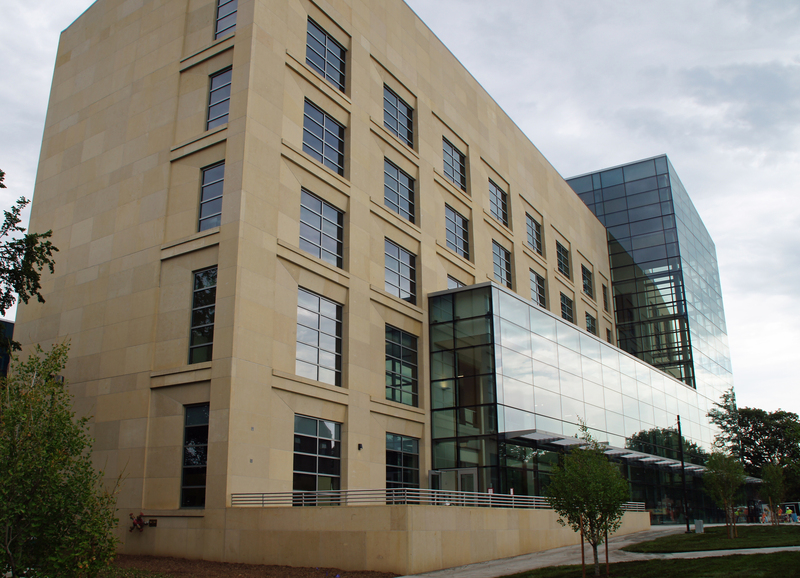 Supporting occupant comfort, energy efficiency and daylighting, Wausau's curtainwall units on UNL's College of Business building were fabricated using Viracon's VNE solar-control, low-e, insulating glass. For elevations requiring enhanced performance, Wausau's 6250i-HRX Series curtainwall was thermally improved by Linetec using a polyamide barrier. "The combination of high-performance glass and framing achieved the specified performance for low solar heat gain coefficient, low U-Factor, high condensation resistance factor and high visible light transmittance," adds Randy Arneson, Wausau's engineered sales estimator. "Along with our high performance and quality, we offer an industry-leading 10-year warranty." Also contributing to the project's sustainability goals, the aluminum used to produce Wausau's curtainwall and window systems is a high recycled-content aluminum billet composition with durable finishes by Linetec. Wausau's sun shades, curtainwall framing members and accent aluminum were finished in a 70 percent PVDF, two-coat, custom champagne color. Linetec also painted the shadow boxes in a pewter color that was blended in-house as a 70 percent PVDF, two-coat mica. As an environmentally responsible finisher, Linetec captures the liquid paints' volatile organic compounds (VOCs) to eliminate the exhaust of potential pollutants. Linetec uses a 100 percent air capture system and safely destroys the VOCs with a regenerative thermal oxidizer, so there is no adverse environmental impact. The painted coatings were applied under Linetec's stringent factory-controlled processes, these finishes meet the American Architectural Manufacturers Association's (AAMA) 2605 industry standards, as well as minimize buildings' maintenance costs and maximize long lifecycles. With respect to longevity, the new College of Business replaces the former 98-year-old college, which had become too small to hold the more than 5,200 business students, faculty and staff who use the building each academic year. Opened in August 2017, UNL's College of Business was renamed Howard L. Hawks Hall in honor of the Omaha businessman, philanthropist and longtime regent Howard L. Hawks. At the grand opening event, Dr. Hank Bounds, president of the University of Nebraska system, concluded, "When we succeed in preparing the next generation of business owners, entrepreneurs, accountants, economists and actuaries, the entire state succeeds. When you have a facility like Hawks Hall, where the learning spaces are second to none, anything is possible. That's a win for students, the workforce and our economy." * Photos by: Alley Poyner Macchietto Architecture, Inc.